More than 1,900 broodmares will be offered in-foal at this year's Keeneland November breeding stock sale. Many buyers will keep the resulting foals from these mares, but some foals will enter the auction ring as yearlings in two years' time. 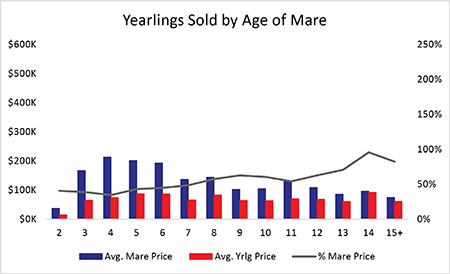 Mares like Blading Gold Ring, who sold for $165,000 in foal to War Front in 2011, can see a big return from their foals at the yearling auctions: Her resulting colt sold for $2.2 million last year, the co-highest price of the 2013 North American yearling sale season. Others, like grade I winner Spain, sold in foal to Storm Cat in 2003 for $5.3 million, may not be so fortunate, with her subsequent foal selling for $150,000, just 2.8% of her cost. 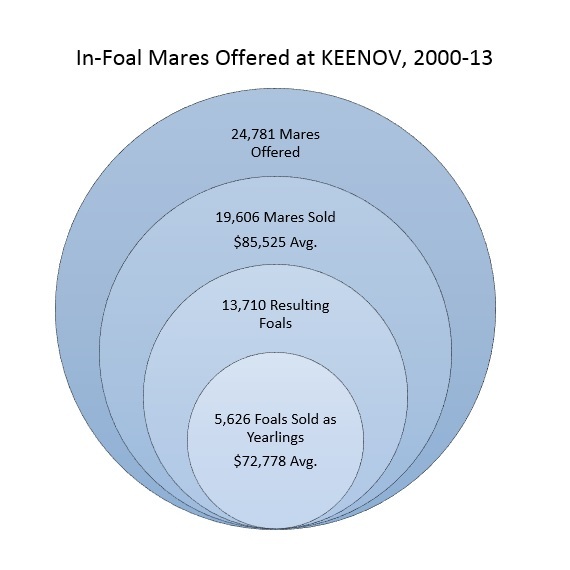 Of all mares offered at Keeneland November from 2000-13, only 23% will sell and have the resulting foal sold as a yearling. Of those yearlings, 52% will bring a higher price than their dam. 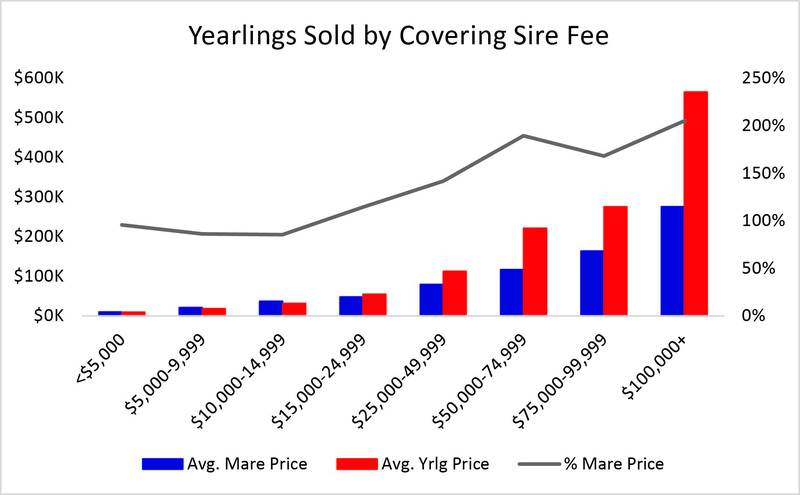 Not surprisingly, yearlings bred on higher fees returned a greater percentage of their dam's sales price. On average, yearlings out of dams bred on fees of $15,000 or more sold more than matched their dam's original cost. The worst return was realized by those sired by stallions in the $10,000-14,999 range, with yearlings returning 85% of the dam's price. Despite statistically stronger average racing performance from foals earlier in birth order and out of younger mares, yearlings from older mares brought a greater return. 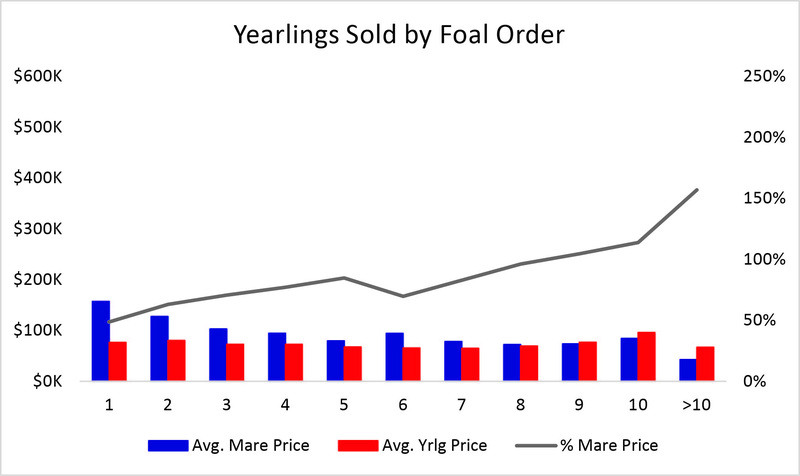 The first through sixth foals out of a dam brought an average of 60% of the dam's sales price, whereas later foals returned 100% of her price. 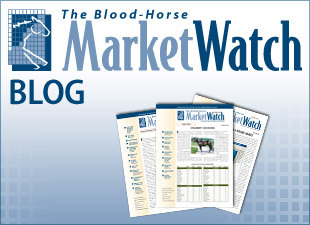 This contradiction can be explained by the fact that a mare's value declines as she ages (she has fewer future breeding opportunities), and that the value of a yearling is likely to increase if its dam is older and more accomplished as a producer.